Ruffleclaw is a furry red monster who lives under the toolshed in Tommy’s back yard. He thinks humans are icky (he calls them “slimy slugs”) but he loves their food, their cozy beds, and the music that he hears coming from Tommy’s mother’s piano. That’s why, against the advice of his monster friends, he decides to move into Tommy’s house. Since Tommy and his parents were not aware that monsters existed, this, as you might expect, causes problems. After Tommy comes to terms with Ruffleclaw’s plans, he tries to hide him from his mom. (Dad is out of town.) But it’s hard to hide a monster that is so messy, rude, and disobedient. I enjoyed the beginning of Ruffleclaw, especially the narration provided by Cornelia Funke. I thought her reading was delightful (it only took me a minute to get used to her German accent) and I loved Ruffleclaw’s character. However, when he moves into Tommy’s house, the story takes on a different tone. Ruffleclaw becomes belligerent and obstinate, something that is cute only for a short time and something that I expect some parents will not appreciate. Consequently, both Tommy and his mother become shrieky, which was unpleasant in the audio version. Ruffleclaw is a children’s book, so all ends well, but everything is resolved a little too easily. This is definitely for a younger audience (5 to 10 years old) and, unlike many of Funke’s previous work, probably won’t appeal to adults except as a cute book to read to children. There is no message or moral. Just a silly story. The interior illustrations, drawn by the author, are wonderful. As much as I enjoyed Funke’s narration of the parts of the story I liked, I wouldn’t recommend missing the illustrations. Published November 10, 2015. The beloved and bestselling author of Inkheart returns with a chapter book full of mischief, heart, hilarious illustrations, and pet monsters! Goodbye, earthworms. Hello, chocolate cake! 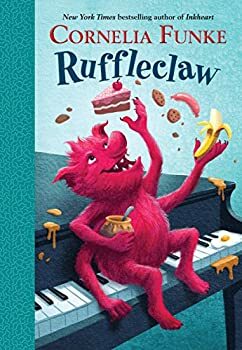 Ruffleclaw is a furry red monster who lives under a toolshed, and he’s sick of eating bugs. When he decides to move in with a family of humans, he climbs right into bed with a boy named Tommy. Tommy wants to keep Ruffleclaw as a pet, but it won’t be easy. Ruffleclaw makes huge messes—he spits, he drinks shampoo, and he eats everything in the fridge . . . along with the plates! Can Tommy teach his monster to behave? Cornelia Funke’s signature touch of imagination and humor delights young readers in her chapter books—Emma and the Blue Genie, The Pirate Pig, and Ruffleclaw. Even if the entire story wasn’t great, that illustration is amazing. I’m so glad you included it! I enjoy silly stories, but this one actually sounds a bit more annoying than silly. I love that illustration! Perhaps I’ll just read the first half (which sounds wonderful!) and then stop.